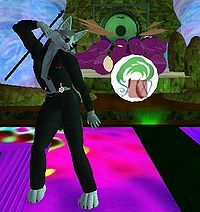 Residents of long-time Second Life furry haunt Serenity Woods celebrated tonight after raising US$1925 during a ten-day drive to save the sim from auction. Forest furs were first notified of problems on the 19th, when community leader Curt Pascal revealed that current land manager, Mako Minogue, had decided to move on due to "RL commitments." This change led to a decision by financier Kerwin Newall to sell the sim. Staff decided a transfer should take place by the end of this month, in time with monthly tier (sim rental payments) due at the start of November. Kerwin appeared to prefer a community purchase, offering the sim to its staff at no profit, and turning down at least one offer by a third party to purchase the sim outright. His initial offer, to finance the sim's purchase over six months, was refused as community leaders had no guarantee of getting their money back if they defaulted. The community around Serenity Woods has gone through much in just a few short years. Known initially as The Forest - the second oldest furry area in SL after Luskwood - it was sold to Second Life land baron Anshe Chung and run by furry management (the Forest Guides) for a year. The Guides abandoned The Forest after Anshe demanded 1/4 of the sim's area be repurposed to increase revenue, uprooting the trees and transferring them to a new sim owned by Foxkin Impfondo. Woodland Guide Ron Overdrive purchased Serenity Woods this February, but found himself unable to keep it, selling it to Kerwin and Mako. Not having the funds on hand, the staff appealed to the community as a whole for money. Many members donated significant amounts - some in the native Linden Dollar (L$), others in real-world currency. Donations over US$50 earned an entry on a special dedication plaque. The largest donor, Harold Starbrook, gave L$65,000 (~US$235), while Curt himself put in US$200. A benefit fundraiser concert held in Luskwood raised the final L$65,000, putting Serenity Woods just slightly over the US$1925 needed. As new owner of the sim, Curt's stated goal is "to preserve the community" with "an almost identical staff."